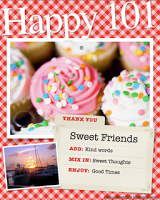 Earlier this week, my sweet friend Beth gave me the Happy 101 award. I am asked to share ten things that make me happy and then list ten blogs that brighten my day. I have been enjoying finding new blogs to read over the past few weeks. Here are some that I’ve been following for awhile along with a few more recent additions. Hope you get a chance to visit some of these as well. Have a great weekend! Congrats on your award and to all the recipients. Thanks for linking up at Friday Follow! It’s such a grand day to meet you, so here I am…your newest blog follower. Happy weekend! Great list 🙂 Now I'm off to check out the blogs you shared since I have electricity again! Hi I am a late follow from Friday Follow please follow me back thanks! I read several of those blogs as well. I really like the spirit of the women as they serve their families. And I totally *heart* Dove chocolate!